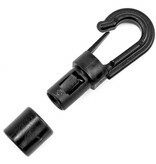 Home Shock Cord Clip 1/4"
YakGear Shock Cord Clip 1/4"
The Shock Cord Hook attaches to the end of 1/4 in. bungee cord and gives you the ability to clip onto various items in your kayak or even the kayak itself. Simply remove the collar off of the Shock Cord Hook, slide the collar onto the bungee cord, stick the end of the bungee cord all the way into the hook, and then slide the collar back up onto the hook to secure the bungee in place.